Arizona kids are accustomed to rain being a fleeting, warm weather experience. This winter has been wetter than any I remember in our 22 winters here, but the kids don't seem to think it needs to be summer to enjoy it. 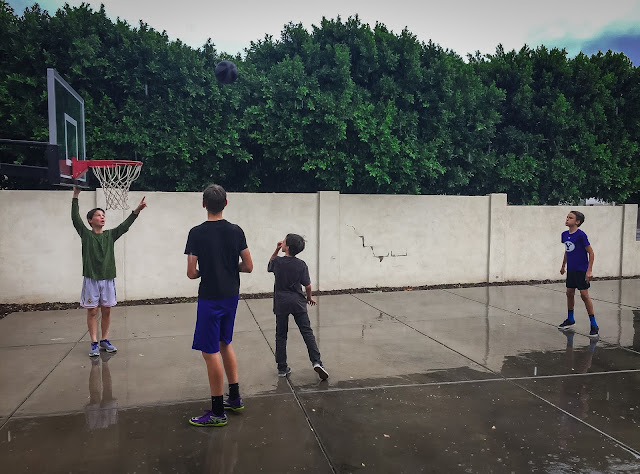 Micah, Hyrum, and two of their friends spent one Saturday afternoon outside shooting hoops, getting soaked, and laughing at the cold. I sheltered in the garage to take the picture, because 22 winters in AZ have thinned my blood, and I can't take the cold at all.